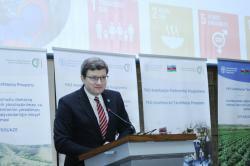 Baku hosted an event dedicated to the launch of a partnership program with the Food and Agriculture Organization of the United Nations (FAO) on January 22. 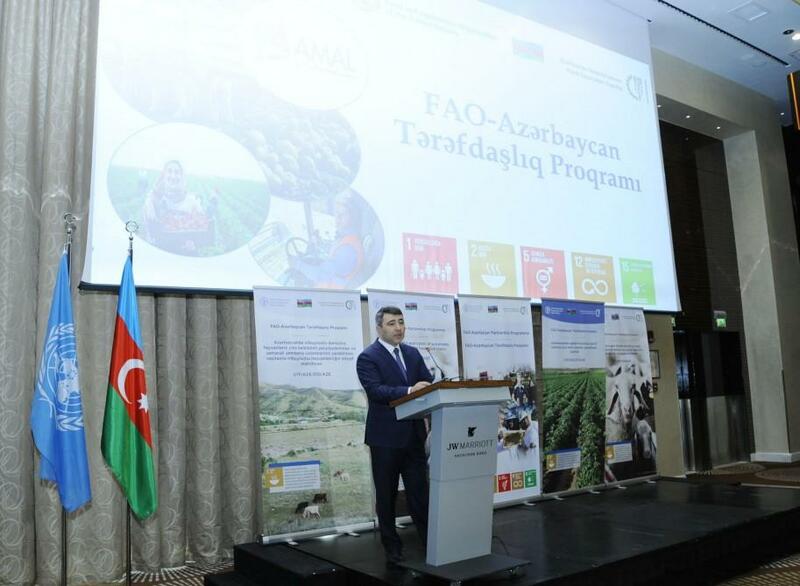 Minister of Agriculture Inam Karimov said that this Partnership Program, signed by Azerbaijan and FAO, allows the cooperation between Azerbaijan and the international organization to enter a new phase. Karimov noted that under the partnership program with FAO, Azerbaijan will not only be a beneficiary, but also act as a donor country and finance various projects. The minister noted that agriculture is one of the priority areas in the non-oil sector of Azerbaijan. Incentive measures are being taken in the country to improve the quality of products. "In 2018, the total agricultural production increased by 4.6 percent compared to 2017. Besides, Azerbaijan’s self-sufficiency in meat and dairy products reached 90 percent, while the country's self-sufficiency in vegetables and fruits exceeded 100 percent," the minister said. Karimov stressed that the main directions of development of the agrarian sector are food security, provision of healthy food and the development of rural areas in the country. "In this regard, our priorities coincide with those of FAO. 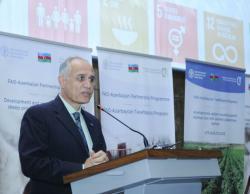 FAO is one of the most important partners of Azerbaijan on international arena," the minister added. 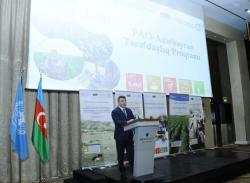 Speaking about the FAO projects in Azerbaijan, the minister noted that the programs and projects implemented within the framework of cooperation with FAO have made significant contributions to the modernization and sustainable development of the agricultural sector in the country. 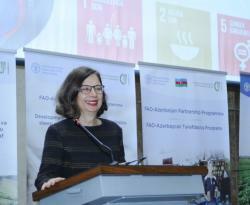 In her opening speech, Head of FAO’s Partnership and Liasion Office in Azerbaijan, Melek Cakmak said: "We can get an opportunity to help other countries on the basis of the experience gained in Azerbaijan through the Partnership Program (FAPP), implemented by FAO together with Azerbaijan." Cakmak noted that FAO attaches great importance to partnership with the private sector and cooperation with the international community in project implementation. "Our goal is to help small farmer groups and achieve sustainable goals," she added. FAO Assistant Director General Vladimir Rakhmanin made a speech at the event in Baku dedicated to the beginning of the FAO-Azerbaijan Partnership Program. Rakhmanin said that the steps taken by the Azerbaijani government in the agricultural sector can be exemplary for other countries. “The Azerbaijani government has determined the development of agriculture as a priority for ensuring the multi-vector aspect of the country’s economy,” he added. “In terms of development of the agricultural sector, the Azerbaijani government makes a lot of efforts to increase not only local production, but also the export potential of this sector," he said. 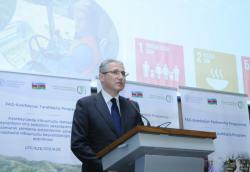 Rakhmanin went on to add that the partnership between FAO and Azerbaijan have been cooperating for the past 20 years. "Our priority areas for cooperation with Azerbaijan are to support the development of agriculture, improve the living conditions of rural residents, as well as support the Azerbaijani government to carry out reforms in this area," Rakhmanin said. Azerbaijan has been a member of FAO since 1995. The organization's office in the country has been operating since 2007. The FAO's Partnership and Coordination Office in Azerbaijan was established in 2015. An agreement on FAO-Azerbaijan Partnership Program (FAPP) was signed in May 2015 and a $ 10 million partnership framework was established for 2016-2020. Azerbaijan Government ratified the agreement and FAPP Operational Framework approved in December 2016. 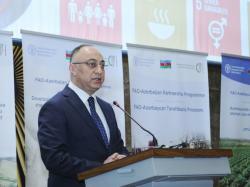 Recently, FAO organized a joint workshop with the Azerbaijani Ministry of Agriculture on two projects called "Sustainable development of feedstuff, creation and implementation of value chains for food production" and "Development of livestock breeding by improving the breed structure of animals in Azerbaijan and the establishment of efficient feeding systems" at the end of 2018.